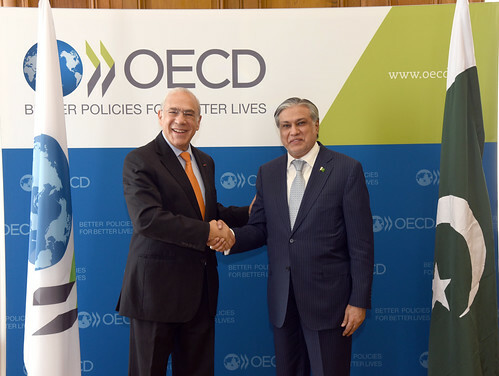 14/09/2016 – Today, at the OECD Headquarters in Paris, Senator Mohammad Ishaq Dar, Minister of Finance of Pakistan, signed the Multilateral Convention on Mutual Administrative Assistance in Tax Matters in the presence of OECD Secretary-General Angel Gurría, therewith becoming the 104th jurisdiction to join the Convention. The Convention is the most powerful instrument for international tax cooperation. It provides for all forms of administrative assistance in tax matters: exchange of information on request, spontaneous exchange, automatic exchange, tax examinations abroad, simultaneous tax examinations and assistance in tax collection. It guarantees extensive safeguards for the protection of taxpayers’ rights. By signing, Pakistan will send a strong signal of its commitment to fight offshore tax evasion and avoidance. Morevover Pakistan is a Member of the BEPS inclusive framework and has such will exchange automatically country by country reporting as required by Action 13 of the BEPS package. The Convention provides the ideal instrument to swiftly implement automatic exchange so the signing and ratification of the Convention is very timely.